The Touching Tiny Lives campus is located adjacent to the Mokhotlong Hospital. This provides TTL with the necessary support in caring for those babies that are too sick to remain at the safe-home. It also allows us to take children at the safe-home for regular check-ups to ensure that they're making progress and growing strong. Without this additional care, many of our babies suffering from HIV, TB, or malnutrition would not be the lively, laughing children they are today. Tiana and Hannah, volunteers from Georgetown Medical School, take Tholohelo and Tlotlisang to the hospital for check-ups. I promise there are actually babies bundled up in those blankets! 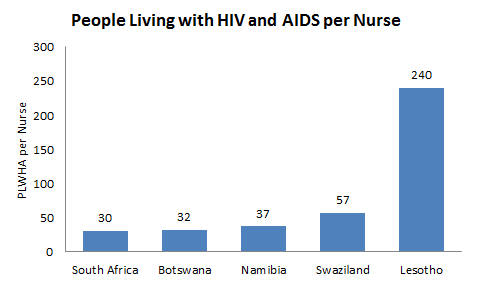 Okay, this is the part where I admit that I’m a bit of statistics nerd and show this same information in some graphs. In North America, we are assured a doctor’s visit within a relatively short time of coming down with even a minor condition. 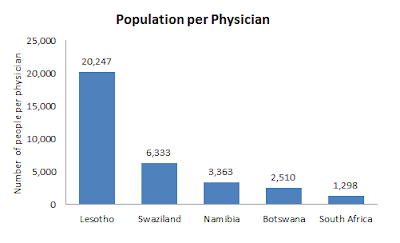 Combine these health system limitations with the challenges of poverty and the rural nature of Mokhotlong and perhaps some insight is provided into the challenging and devastating nature of this epidemic in Lesotho. 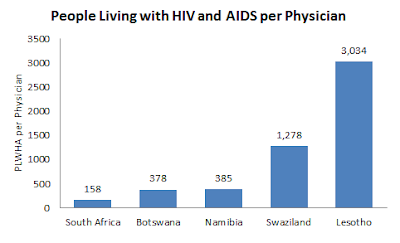 *The data in this post was taken from Reviewing" Emergencies" in HIV and AIDS-affected Countries in Southern Africa: Shifting the Paradigm in Lesotho, 2009.